As a young adult, I had a hard time trusting in God's plan for my life. Instead of taking time for silence to hear Him speak to me, I was busy making plans for my life. I didn't consult the big man, and there were many consequences that were brought to my life. Instead of trusting that God would always have my best interests in mind and allowing Him to bring me through life as He saw fit, I tried to take complete control over everything. 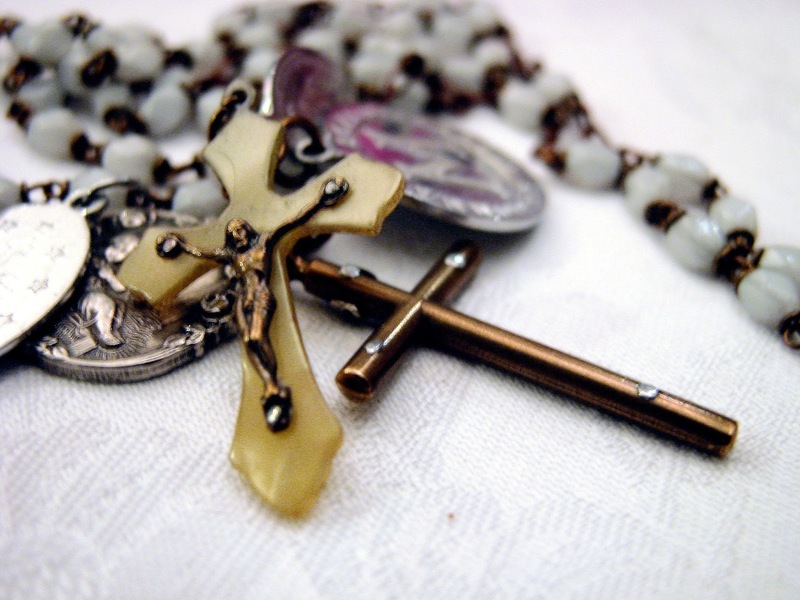 My prayers were superficial and I did not have a real relationship with Jesus. My life was empty. It was a hollow existence and upon looking back at it, I did not have true happiness. While God was patiently waiting for me to let Him in, I was busy planning my life. I thought I knew where I was going, what I was doing, and how I was going to get to all these points in my life. Unexpectedly, I was pregnant within the first month of my marriage. It was in that moment that God forced His hand into my life. I didn't know it at the time, but my life and heart was forever changed in that moment of conception. Although it took a few years to notice, God was tired of waiting. He charged into my heart and began to change me. Instead of finishing my master's program, I decided to drop out of it. I left my job. I decided to be a full time mother at home. In all of my planning, I forgot that the one thing I wanted more than anything else in the world was to be a mother. My dream had come true and I dropped all my life planning in order to say yes to God's call to me. This was the first unselfish yes I had given God in my entire life. When I said yes, my heart opened a window. Just one window, but it let God in a little more. Boy, He had a lot of work to do. I had built up so many cobwebs and everything was disorganized. But He didn't care. I had finally let Him in. As my life rapidly changed over the next few years, I put myself on auto-pilot. I tried to read some of the Bible and I began to pray with a bit of feeling. 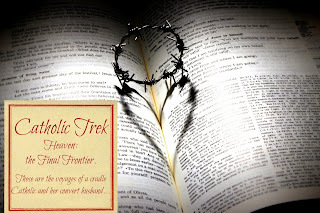 Even though I was still somewhat superficial in my prayers, I was beginning to allow God into more of my daily life. Because I stopped planning for myself, He started to gently plan for me. I didn't even notice it at the time, but He put certain people in my life that planted seeds for me. These people made me grow; sometimes growing pains were involved, and other times it was incognito growth. As I grew, I became more sure of myself and I started hearing Him speak to me. At first I heard whispers, but those whispers have been growing louder over the years. One of the biggest moments of God's life in me is when I first starting thinking about home educating Sebastian. It started as a whisper on my heart, and I prayed about it for months before even mentioning it to my husband. Every time I thought I heard God tell me to homeschool, I asked for a sign. He kept giving them to me, but I kept thinking it was coincidence. At one point there was a message in out bulletin about homeschooling. I still needed "a sign" from God because I wasn't listening! It ended with a drive past a billboard that said "Homeschooling is God's Choice for Your Children." God literally gave me a sign because I was being such a dunce! He could not have been clearer. In the end, we said yes to homeschooling and it has brought so many blessings to our home. 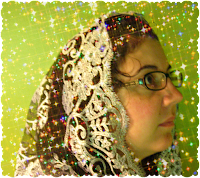 I cannot remember why I started to think about veiling, but I do remember praying about it. At one point I bought a veil and occasionally wore it to Mass, but I felt so unsure of myself. I even had the words of some people in my head, telling me I would be a distraction if I veiled. While I loved the idea behind veiling, I was afraid. I wasn't ready at that time to commit to veiling. Fast forward a couple years. In those years, I once again planned my life without consulting God. Struggling with anxiety and depression, I turned to God. I dove into His word and His arms like never before because I had no where else to turn. He was there. He was waiting for me to open up and run to Him. My life turned around again when I became pregnant with my third child. Life changes everything! 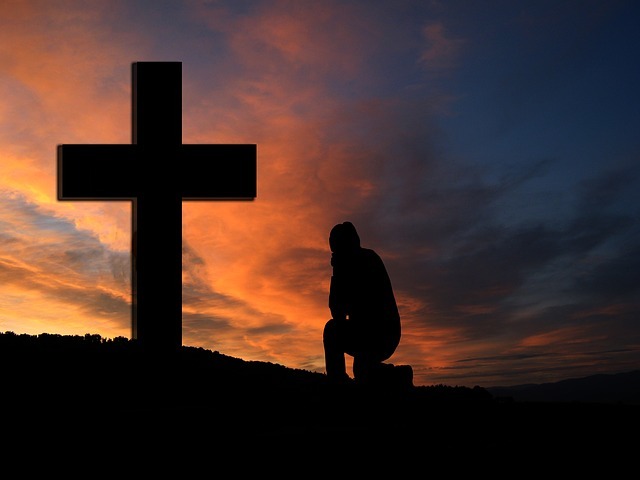 With raw emotion, I was able to turn my focus from inward selfishness to His infinite glory. It was this change that catapulted my faith. I started reading the Bible again, and this time IT MADE SENSE! It was not just words. It was pure love. It was real. My prayers became more outwardly focused. My life started to make sense!! When I started to veil full time, I stopped being afraid. I realized if I was a distraction for someone, it wasn't my fault. Honoring God and His call for my life is more important than what other people might think about a piece of lace on my head. Fortunately, I have not received any negative comments directed at me. Each time I go to Mass or Adoration, I am reminded what is important and that this example I am giving my children is worth it. Since stepping out on faith, my heart has started to bloom. I am still very little in my faith. 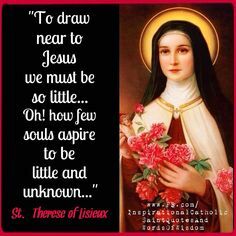 As St. Terese of Lisieux has taught us, "My little way is the way of spiritual childhood, the way of absolute self-surrender." With her as a guide, I am trying to follow a short path to heaven. She has taught me to use every opportunity to lay my actions and prayers at the foot of Jesus. It could be a smile, kind word, or doing chores without complaining. Although the little way seems easy, it is not! I am not always successful, but I continue to try, even after my failures. My journey is at its very beginning. I am now just starting to have a real relationship with Jesus. Although I have changed over the past few years, I know there will be more change to come. I am learning to trust God with every moment in my life. Sinning is a part of life, but God's mercy will be there to pull me out of it. Thank you, Jesus, for your love. I am just a small soul in your large arms. The rest of my story is still being written. I pray for my faith to be unbounded, the courage to share it, and the strength to do what He wills of me in this life.